Enjoy an unforgettable short break in a winter wonderland in Swedish Lapland at the homely Camp Ripan Resort Hotel. 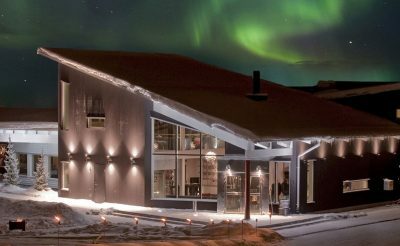 With excellent facilities including spacious accommodation, high quality restaurant, Aurora Spa, a host of optional activities and a great location for viewing the northern lights, this is the perfect winter escape. The location of this hotel could not be better, right on nature’s doorstep and just a short transfer from Kiruna Airport, it is close to ski, snowmobile and husky sledge trails but also within a 10 minute walk to the shops and restaurants of Kiruna. Included in this 3 night break is a 3 hour Forest tour by dog sled, but you can also fill your day with other optional excursions such as nordic skiing, snow shoeing, snowmobile tours, horse riding, wildlife and nature tours, moose safari or perhaps visit the world famous Icehotel. Hotel Ripan's Aurora Spa is a perfect place to relax and enjoy the different facilities on offer such as the indoor or outdoor hot pool, sauna, gym and treatments, with entrance included once during your stay. Sit back and relax or be as active as you wish, whatever you prefer, there are plenty of options during your stay at Ripan Resort, the cosy accommodation offers a perfect retreat after a day of snow activities. This 3 night break is also possible on other days when flying to Kiruna via Stockholm. Prices on request basis. On arrival at Kiruna airport, you will be met by a representative from Hotel Camp Ripan and transferred to the hotel (journey time 15 minutes). Check-in to the accommodation and relax before the evening meal. After dinner relax in the Northern Light room while watching a slide show about the spectacular aurora. After breakfast, get prepared for the morning activity which departs at 09.30. The dog sled tour is the perfect way to experience the beautiful winter wonderland. 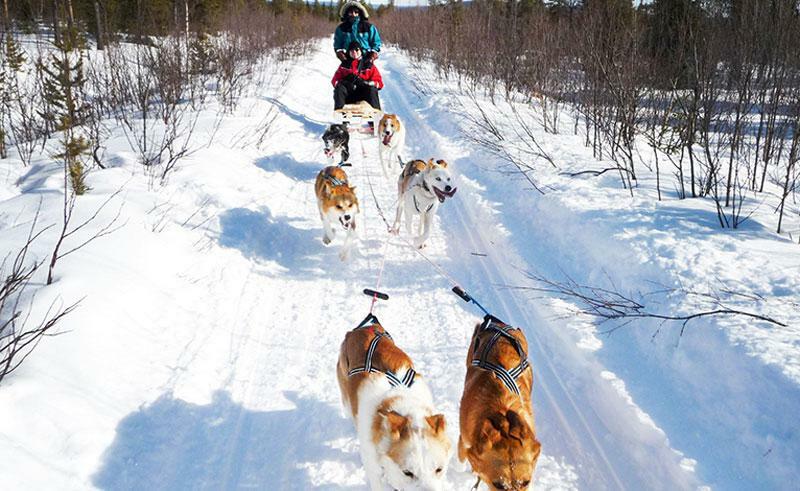 Sitting on a sled pulled by a team of exciteable yet friendly Alaskan Huskies the trail you’ll follow winds its way through pine and birch forest down to the Torne river. Along the tour you stop at a traditional Sami tent (lavvo) for hot drinks and snacks. If you’re lucky you may see reindeer or even a moose on the trail. Winter cloting is provided. Back at the hotel you have free time before dinner in the restaurant. The area surrounding the hotel is a gigantic arena for winter activities. You can choose from a wide range including snowmobiling, snowshoeing, moose safari or northern light trips. Locally you can visit the church or maybe a tour of the mine. It is also possible to rent skis or snowshoes to explore the area. In the afternoon you’re able to visit the Aurora Spa at the hotel and enjoy a relaxing time using the facilities including the spa ritual Stävan. After breakfast and depending on the flight departure time, the morning is free before taking a transfer to Kiruna airport for the flight back to the UK. Head to Swedish Lapland for New Year celebrations. Celebrate a picture perfect Christmas in Swedish Lapland at Hotel Camp Ripan.